[miau] Big Ben is an older slot machine, but remains extremely popular. It is a very fun, colorful game to play and entices the gamer with many sounds. This is very important to gamblers, not only the graphics, but the noises associated with a machine. Like many other slot machines Big Ben follows a very distinct theme, London. 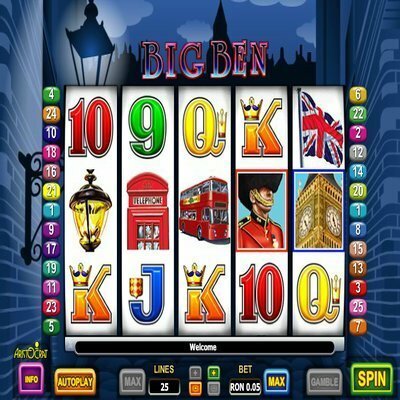 Created by the great slot machine developer Aristocrat, the game is focused on England’s famous Big Ben clock tower. The symbols also coincide with the theme featuring double decker buses, the British Royal crown, phone boxes, the flag of England and local taverns just to name a few. Big Ben offers five reels and 25 paylines. The most exciting thing about this machine are the bonus features. It offers two, a free spin bonus or the Big Ben bonus feature. There’s no way to miss it when you receive a Big Ben symbol on the screen because it makes an awesome clock noise to get your attention to let you know you are on the road to the bonus round. In the Big Ben bonus round feature, the gamer can win up to a 500 times multiplier, one of the main reasons why this machine continues to be so popular in casinos. There is also a wild symbol that substitutes for other symbols and in this particular slot, a wild symbol doubles the payout of any winning combination, which is a great extra feature. This symbol is the British royal guard so keep your eyes open for this man because he could lead to a potentially large payout if paired with the right symbols. He also does not substitute for the Big Ben symbol. The Big Ben clock tower symbol is the scatter symbol in this game. Three or more of this symbol scattered on the screen activates the free spin bonus. If you receive three symbols you will win 15 games, four symbols will award you 20 free spins and five symbols will give you 25. The bonus game can be retriggered within an existing game. The Big Ben bonus feature is activated when the Big Ben symbol appears on reels one and five at the same time. The number of time Big Ben chimes determines your prize amount. This is where you can win up to 500 times multiplier. This game features exciting bonuses and large payouts. It continues to be a popular machine despite it’s age. People gravitate towards it because of the fun noises and the potential for a large payout.